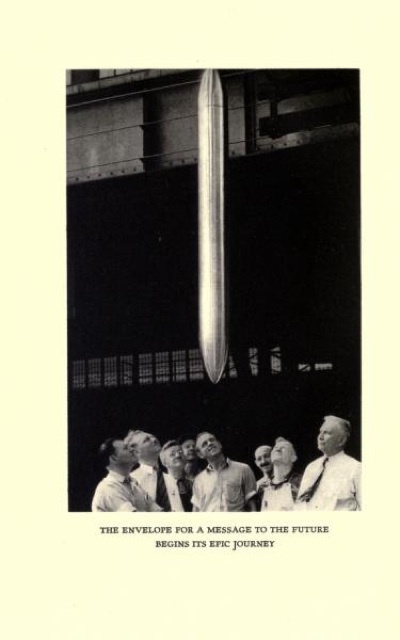 The Westinghouse Time Capsule was the object that has defined time capsules since then: a container of objects from the present buried to be resurrected at a specified date in the future. To commenorate its burial during the 1939 World’s Fair and to act as a manual for those who might dig it up in the future a book was published and distributed to the public. 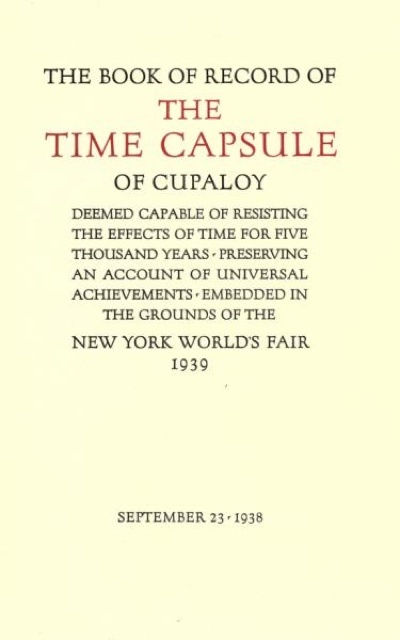 This book is called The Book of Record of the Time Capsule of Cupaloy. It describes the logic of time capsule, its contents, and what it hopes to represent. It takes a very long view. A limited number of copies of this book were printed and every now and then one is for sale on the used book market. Prices vary. I’ve seen copies for many thousands of dollars, and I’ve seen them for a hundred or so. There is now one copy for sale on Alibris for a reasonable $145. That’s not the cheapest I’ve seen, but neither the most expensive. Click here if you are interested. If that amount is more than you want to spend there’s good news. You can download a free digital PDF of the book (legally, it’s out of copyright) from the Internet Archive. Having multiple copies of the book distributed on many individual hard discs throughout the world is actually the best way to preserve anything.